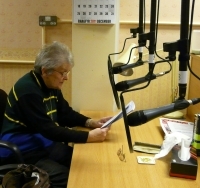 Weekly editions of the newspaper are broadcast on Radio Glangwili together with monthly supplements in both languages. The talking newspaper was recorded at Glangwili studios initially. Then, as the Talking Books took flight, new studios were found for the books and newspapers and to this day the two charities have shared studio facilities and offices. Blind Societies have supported the Talking Books scheme along the years.